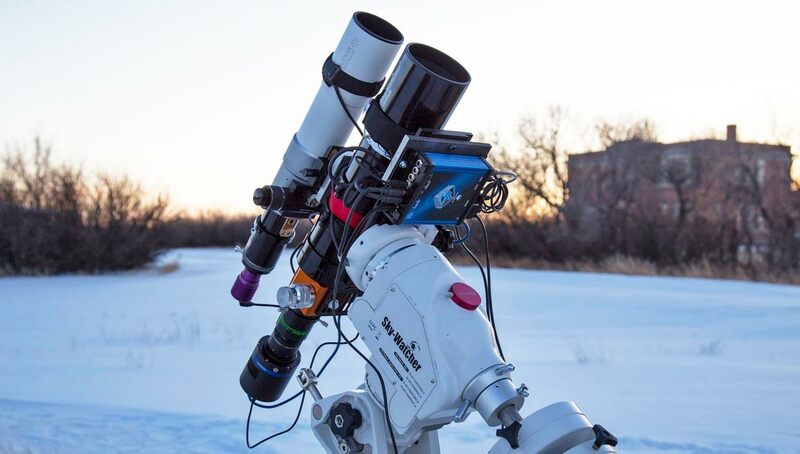 The featured astrophotography equipment setup for this week includes a beautiful snow-white Sky-Watcher AZ-EQ6 Equatorial GoTo mount with a neatly packaged 80mm imaging refractor telescope riding on top. This incredibly sharp looking deep-sky astrophotography is proudly owned by fellow Canadian, Stan Noble. Stan’s primary imaging telescope is a Sky-Watcher 80ED APO refractor, complete with a Moonlight focuser. I love the design of this setup, especially the mounted Pegasus Astro Ultimate Power Box mounted underneath the telescope. I must say this is one clean looking rig, and it looks like Stan’s backyard is a marvelous place to do some serious imaging. Stan has an incredible photo gallery on Flickr, featuring some exquisite astrophotos using this setup. 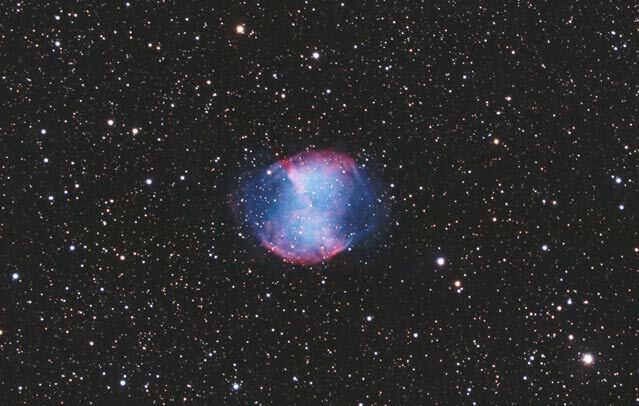 The Dumbbell Nebula shown above is one of many impressive photos taken from Western Canada. If I ever finally take a long road trip out west, I’ll be sure to pay Stan a visit in the land of the living skies. I can’t help but admire the organization of this setup, particularly with the dew heater straps and focus motor connection. 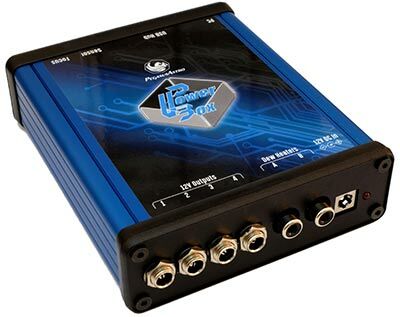 That blue box you see mounted beneath the scope is called the “Ultimate Power Box”. The Power Box not only controls the Pegasus Astro Focus Motor, but the dew heater straps on the imaging and guiding telescopes. This keeps all cables free from snagging while in operation, as they move neatly atop the telescope rather than dangling below. 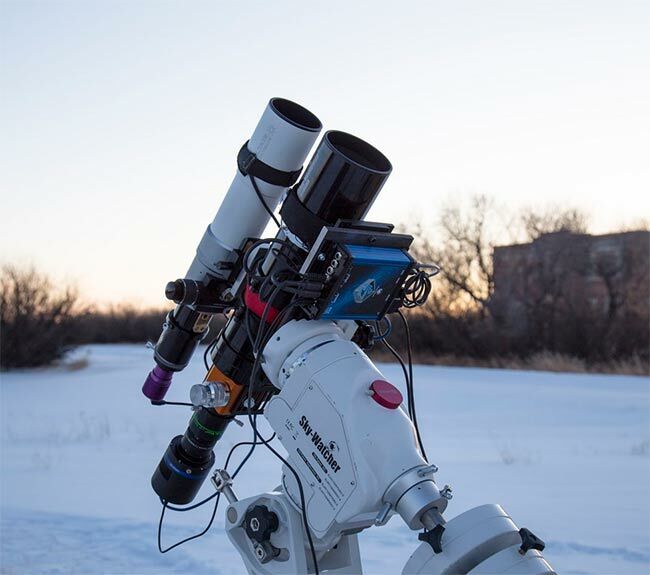 The Sky-Watcher AZ-EQ6 mount tracks the night sky with ease with Stan’s compact and lightweight setup riding along on top. The AZ-EQ6 is rated for a 44-pound payload, so this mount will serve him well if he decides to mount a heavier telescope configuration in the future. Stan clearly understands the importance of a quality mount when it comes to astrophotography. My main workhorse is a SkyWatcher 80ED APO with a Tele Vue .08 Reducer\Flattener & QHY 163C camera. I use an Altair Lightwave 66ED & Altair GP224C for autoguiding. I have a Pegasus Autofocus attached to the Moonlight focuser which is controlled by a Pegasus Ultimate Power Box. The mount is a Sky-Watcher AZ-EQ 6 and is run by EQMOD through the Power Box USB hub to the laptop. The Power Box also controls the Dew heater strips. I use Astro Photography Tool & Sequence Generator Pro for capture & use plate solving in both to acquire my targets. Since I started plate solving I have no need of a finder scope, what a time saver. I started using Team Viewer & Ethernet over Power boxes to control the setup from my warm comfy office, which is great for those cold Canadian nights. Thank you for sharing your setup with us, Stan! For a chance to be featured as the Backyard of the Week, please fill out this form and include the details of your setup. 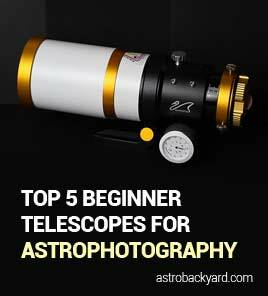 This is a great way for others to see a deep-sky imaging setup that is being used to successfully photograph the night sky.